WWDC is only 1 month away, and just like the last few years the (unofficial) WWDC Attendee List and Slack chat is back again! What started as a way for me to keep track of who of my tech friends and idols did get a ticket and who didn’t, has turned into a useful resource for attendees planning their trips to San Francisco. Last year we ended up with nearly 500 names on the list and almost 1000 people in the Slack chat, so let’s try to beat that this year. Sadly I won’t be making the pilgrimage to The City by the Bay this year – the crazy hotel prices were just too much for me to stomach, especially considering how much will be streamed live. But I will be hanging out in the Slack chat with everyone else so feel free to join us even if you aren’t going either. If you are going to San Francisco this June, whether you managed to get a ticket or not, add your details to the attendee list with this form, then share the link with anyone else you know who is going. You can view the full list here. I will try to add everyone who adds their name to the list to a Twitter list as well. The Slack chat is a place for everyone who’s interested in WWDC, whether you’re attending or watching at home. It’s a great place to share plans, tips and tricks, party details, etc. There’s already over 40 channels set up for everything including first timers, women attendees, language specific, parties, survival tips and more. One last bit of fun. As I did the last three years, I will also try to keep track of everyone that adds their details to the list on a map. I will use the Twitter usernames people provide to lookup the locations entered on their Twitter profiles. Some people put some interesting things as their locations so some pins may be a little off. The map is also not auto-updating so I’ll probably periodically regenerate it as the list grows. You can view a full screen version of the map map here. WWDC is upon us again! For the last couple of years I’ve created a Google Doc spreadsheet, Glassboard and Twitter list to try to keep track of everyone that is going – I find it easy in all the ticket chaos to lose track of who of my tech friends and idols did get a ticket and who didn’t. This year, fortunately I am one of the lucky few who got a WWDC ticket, so I’ve decided to create another attendee list of 2015 as the previous years ended up with over 500 names on it and it turned out to be a really useful resource for developers attending the event to keep in touch. The last two years I created a Glassboard for attendees to use as a place to chat, share plans, party details, etc. Sadly, Glassboard is no more, so this year I’ve decided to go with everyone’s favourite team communication app, Slack. One last bit of fun. As I did the last two years, I will also try to keep track of everyone that adds their details to the list on a map. I will use the Twitter usernames people provide to lookup the locations entered on their Twitter profiles. Some people put some interesting things as their locations so some pins may be a little off. The map is also not auto-updating so I’ll probably periodically regenerate it as the list grows. This article was originally written for and posted on the Other Media blog. Like many serious watchers of the digital universe, the team at Other Media is very Apple-aware and we are fortunate to have developed a great relationship working with – and sometimes for the brand. Apple Watch is the Silicone Valley giant’s first crack at creating a new product category since iPad was introduced five years ago. However, unlike iPad, which was an evolutionary product that built on technology pioneered in iPhone and iPod Touch, Apple Watch is far more revolutionary. It not only introduces a new form factor; it brings with that several interesting new types of user interaction and interfaces. The toughest obstacle at launch for a ground-breaking product like Apple Watch is the fact that (to paraphrase Steve Jobs) “a lot of times people don’t know what they want until you show it to them”. The answer to this fundamental question for me can be found by looking at Apple Watch’s illustrious ancestor – the wristwatch. One of the main reasons the wristwatch has survived for over a hundred years is simply its convenience. We all want to know what the time is at various points throughout the day and there is no more convenient method than checking the watch on your wrist. You simply lift your wrist, read the hands or digital display – and that’s it. You’ve got your answer in less than two seconds. This is, of course, exactly the same core function that Apple Watch provides, except now it’s not just the time you can check. With just a glance users get access to messages, calls, news, sports scores, stocks, reservations, flight information, weather… the list is endless. Of course, you can already do all these things with your iPhones too and that will continue to be the case. However, the sheer glanceability and convenience of Apple Watch is what makes it such a compelling companion device and is the main reason I will likely be getting one. Consider how long it takes to dig your iPhone out of your pocket compared to just having to raise your arm. This difference multiplied by the countless interactions over a day could result in considerable time saving. It’s the same principle that makes Touch ID such a great feature. Sure, it seemed like a gimmick at first, but if you’re used to unlocking your iPhone or iPad using your fingerprint, then you are forced to enter your passcode, it becomes obvious how much that convenience is worth. Perhaps this is an over simplified view. Of course the success of the wristwatch is not purely about telling the time. Even the supposedly ‘functional’ watches like ‘pilot’, ‘diver’ and ‘chronograph’ actually play heavily on style and branding, and layer luxury, self-image and functionality side-by-side. This is mirrored in the Apple Watch design, with nods to its horological ancestors like the watch face complications, digital crown and the milanese loop strap, which demonstrate Apple’s awareness that the Watch’s desirability goes beyond its feature set. Apple is positioning Apple Watch as another ‘must have’ product by focusing on fashion in a way it has never had to with any previous product. This is evident in the vast collection where the most expensive Edition model costs 45 times the most affordable Sport model, despite being functionally identical. Check out the 12 page Apple Watch ad from Vogue magazine that sells the product as a piece of designer jewellery rather than the latest consumer electronics gadget. Apple is not the first company to release a ‘smart’ watch, but it is arguably the first to create a product that focuses on fashion to the same degree as functionality. We believe Apple Watch offers the full system integration that third-party watches simply can’t. Clearly, it goes beyond simple fitness tracking offered by the various fitness bands available and, thankfully, it doesn’t try to be a ‘smartphone for your wrist’ like many first-generation ‘smart’ watches for Android. Here Apple has carefully defined which features suit the case of a watch and which should remain on the phone. For example, Apple Watch can be used as a camera viewfinder and remote shutter for your iPhone, but doesn’t include a built in camera. Think of it as a highly desirable, functional companion to your other Apple devices if you will. So with everything in place for Apple Watch to be a success, what new opportunities does it offer for brands and existing apps? There are currently over 1.4 million apps available on the iOS App Store, meaning it’s getting increasingly difficult to get noticed without a substantial marketing effort. The release of Apple Watch hits the reset button on this number for the first time since the App Store was launched 6 years ago. Only a fraction of these apps will offer support for Apple Watch at launch, therefore making it a lot easier to get noticed. Apple also introduced an Apple Watch companion app with the release of iOS 8.2 that devotes an entire tab to an Apple Watch specific view of the App Store – the first place new Apple Watch owners will turn to when trying to find apps for their new gadget. It’s fair to assume that Apple will also introduce Apple Watch specific Top Charts, Editor’s choice and other promotions. The team at Other Media are excited to already be working with some of our clients on apps for Apple Watch that will be available in the App Store when it is launched at the end of April. We are looking forward to working with new and existing clients to really push the new technology. Be sure to read the second and third parts of this series that take a look at how we will go about designing and developing for Apple Watch. 1. Apple Watch Stainless Steel 42mm with Black Sport Band, in case you’re interested. The dumbwatch industry’s best hopes are either their own successful lines of Android Wear watches, or praying that the overlap between their customers and smartwatch buyers doesn’t get very big. I think he’s spot on. It seems inevitable that once we start moving towards smarter, more connected devices on our wrists we are unlikely to want to go back. In many ways this is a real shame. I love proper automatic watches. I love the intricacies of their mechanical innards and the history that has gone into perfecting their designs. I’ve always aspired to one day own a special timepiece that I could pass down to my future children. The analogy that fits dumbwatches best for me is that of classic cars. Plenty of people like to own classic cars as a piece of history or art. Sometimes they are even fun to drive. But no one wants to do their daily commute without the conveniences of air conditioning, cruise control, a bluetooth sound system, air bags, and all the other advances that come with owning a modern car. As Marco states, the makers of the more affordable Quartz watches will surely have to create their own lines of Android Wear watches, in the same way that have Nokia attempted to transition from dumbphones to smartphones. But for the high-end brands, I’m not really sold on the idea that people will spend tens of thousands of dollars on something that will be out of date within a year. For me, their only hope is that people will still want to own the classic car equivalent of a watch. After all, people do like to spend a lot of money on classic cars. Indie iOS development has had a bit of a tough time of it recently what with all the ex post facto rejections. It has tarnished the excitement about the innovation that has been made possible by iOS 8. However, one gem has managed to escape the app review chopping block: Workflow. If you haven’t downloaded it yet, get it now! Workflow is an immensely powerful tool that lets you string actions together into workflows that run on your iOS device. It’s the best demonstration I’ve seen of the power of iOS 8 since it launched 3 months ago. 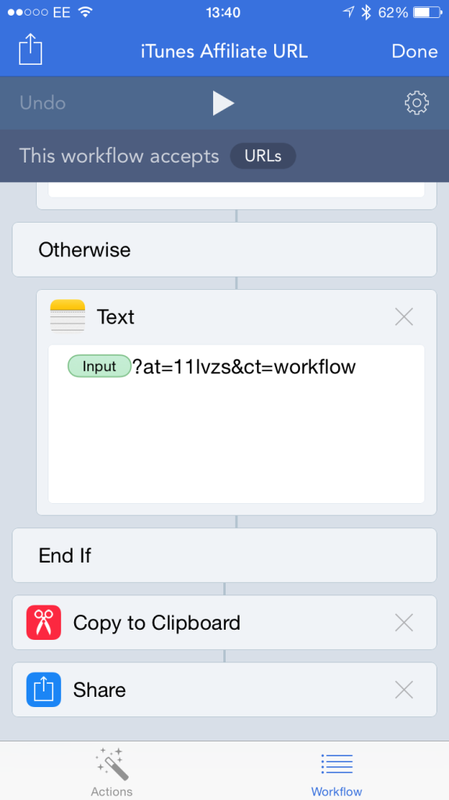 One of my favourite features is that you can create workflows as Action Extensions that can be accessed from the standard iOS share sheet, allowing you to fill gaps left by other developers. My first attempt was to create an Action Extension workflow for generating iTunes Affiliate links that could be triggered from the share sheet in the App Store app. It took me a while. Like working with many proper programming or scripting languages, getting Workflow to do exactly what you want can be a little challenging. This is probably partly due to the limitations of iOS 8, but may also be because this is only version 1.0 – I’m sure many more features and improvements are in the works. I went through a few iterations. My first problem was that links shared from the App Store app are shortened versions that need to be expanded before the affiliate query string can be added. I first tried using the Clean Links app, but bouncing out to a separate app returned to the Workflow app instead of the extension running in the App Store. My second attempt tried loading the URL using the ‘Get Contents of URLs’ action but I had issues with frame load interruption errors, probably caused by iOS’s desire to open the link in the App Store app. Finally, with a little help from Dr. Drang, this is the end result. You can trigger it from the App Store share sheet, it expands the short URLs using longurl.org, and it creates a complete affiliate link ready to be shared however you wish. It’s WWDC time again, and that means plenty of chaos around tickets. Last year I totally lost track of who of my tech friends and idols did get a ticket and who didn’t. So I created a Google Doc spreadsheet, Glassboard and Twitter list to try to keep track of everyone. This year, sadly I wasn’t one of the lucky few to get a WWDC ticket, however, I thought it was still worth creating another attendee list for this year as last year’s ended up with over 500 names on it and it turned out to be a really useful resource for developers attending the event to keep in touch. If you’re a WWDC veteran or this is your first time attending, I hope this list will help you find out which of your friends are going to be heading to San Francisco in June. If you are going to San Francisco this June, whether you managed to get a ticket or not, add your details with this form, then share the link with anyone else you know who is going. You can view the full list here. I will try to add everyone who adds their name to the list to a Twitter list as well. I’ve also created a WWDC 2014 Glassboard that you can use as a place to share plans, party details, etc. You can join the board using the invitation code yjlkt. As I did last year, I will also try to keep track of everyone that adds their details to the list on a map. I will use the Twitter usernames people provide to lookup the locations entered on their Twitter profiles. Some people put some interesting things as their locations so some pins may be a little off. The map is also not auto-updating so I’ll probably periodically regenerate it as the list grows. The BAFTA nominations were announced recently and while I was reading the list of movies, cast and crew, it made me wonder why most major movie awards still have separate categories for Best Actor and Best Actress. Why are male and female actors not compared together? Acting is not a sport and being good at it does not require a certain physicality, so I see no reason why men and women can’t be judged together. Male and female directors are compared together for a single award so why not actors? In case I was missing something obvious, I posted this musing on Twitter to my modest number of followers. Fortunately, Casey Liss retweeted my question to his ample following and so a decent discussion started. As expected, a couple of crazies felt the need to point out that men and women are different and that there is nothing wrong with separating them. But fortunately, most people were able to question why this segregation still exists as well. Many pointed out that the reason is probably to keep the number of individual awards up so the ceremony running time is longer and more adverts can be shown. This is probably the case (and certainly a little depressing), but they could, of course, add new more interesting award categories that don’t involve gender segregation – I liked Stuart Gibson’s suggestion of ‘Best Debut Performance’. A few others suggested that without segregation there is the chance that female actors may get entirely ignored by the ‘traditional’ and sexist Hollywood veterans that decide on the nominees. This could definitely be true as only four women have ever been nominated for the Academy Award for Best Director and only one has won it, but segregation is certainly not a solution to this problem, it is merely a distraction. The British and American movie awards already seem out of touch with real movie-goers and this out-of-date gender segregation is surely only making it worse. There may be many more reasons why the separate categories should exist, but I’m fairly certain none are legitimate reasons that we couldn’t find better alternatives to. So I hope that at an award ceremony in the not-so-distant future an award is given for ‘Best Performance’ and I really don’t care if it’s to a man or a woman. 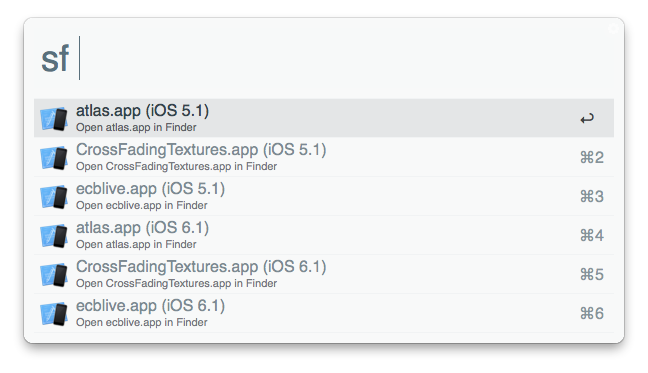 I find it very difficult to remember the ridiculous path to the folder where all the iOS Simulator files are saved so I wrote a little Alfred workflow to make finding my apps’ documents a little easier. To use it just type ‘sf ‘ into Alfred at it will find any apps that are currently installed on the iOS Simulator across all versions of iOS. Keep typing and it will refine the search results to match your search term. Hit return and it will open the simulator folder in Finder. Ctrl+Return – Reset app storage by deleting contents of Documents and Library directories. Sky Arts: Inspiration Everywhere is a fun iPhone app that helps you to discover moments of creative inspiration while out and about. The app was created by the team at the OTHER media for BSkyB. I was the sole iOS developer working on the project and built the app. The app works in conjunction with a bespoke backend service built by my colleague Mateusz Stawecki that takes articles on the Sky Arts website and finds related geotagged pages on Wikipedia to identify relevant culture points of interest. The app uses background location services to monitor the users location and looks for moments of inspiration nearby. When the user passes a place that is connected to an artist, actor, director, author or band or a painting, film, play, book or song they’ve created – they receive a notification. When they open the app the app shows how the location is connected to the artist or a work of art along with an exclusive video from Sky Arts. The app makes use of Core Location for background location monitoring, Core Data for data storage along with Core Graphics and Core Animation for the really cool concertina effect when expanding the moment cards. Atlas by Collins™ is an iOS app that reinvents the atlas by telling stories by visualising data onto a beautiful 3D globe. We built the app at the OTHER media for Collins Geo. I was the lead developer on the project and wrote the vast majority of the code. The app includes a thoroughly detailed gazetteer with over 200,000 entries along with many downloadable globes. 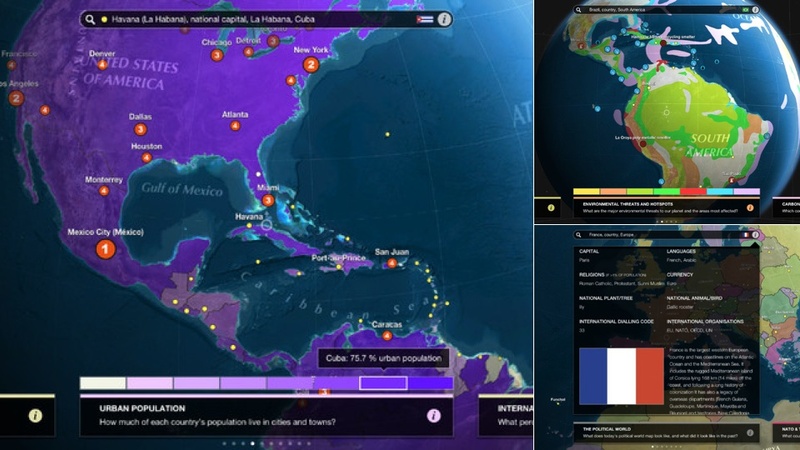 Each globe allows you to see themed information presented in beautiful mapping and graphics. In the Energy globe for example, you can overlay the Earth with information on energy resources, reserves, production, and consumption. We recently released version 2.0 that saw the introduction of the globe store that brings an even larger range of globes available as in-app purchases. The app has received lots of attention including App of the Week on Gizmodo, the 20 Best iOS And Android Apps Of 2012 on TechCrunch, it won the Digital Data Product award, Overall Winner award and CHK Cup at the IMIA Map Awards and has been featured several times in the App Store. Building the app was a massive project and we learnt a lot in the process. It integrates OpenGL ES and UIKit to provide an immersive combination of a 3D globe and an informative and easy to use 2D interface. We also made use of technologies such as Core Data for storage, Core Graphics for custom drawing and HTML 5 for content styling.